Benjamin Jonson was born around June 11, 1572 in Westminster, England. His father, a clergyman, had died a month before his birth. His mother remarried just two years after to a master bricklayer. After Jonson attended school at St. Martin's Lane, he was sent to Westminster School where one of his teachers was William Camden, a famous English antiquarian and historian. After Westminster, it is said by many that Jonson had gone to the University of Cambridge; however, Jonson himself said he did not attend a university but was put into a trade, probably bricklaying with his father, immediately. After a short stint in the Low Countries as a soldier, Jonson married sometime before 1592 with registers of St. Martin's Church stating his eldest daughter, Mary, had died in November of 1593 when she was just six months old. His eldest son, Benjamin, died ten years later of the plague inspiring Jonson to write On My First Sonne. In 1596, Ben was part of a literary circle of associates with Christopher Brooke and John Donne, whom he quickly befriended. Jonson begun work with Lord Admiral's acting company in the summer of 1597 performing under Philip Henslowe's management of "The Rose". Around this time Jonson had already begun his work of writing original plays for the Lord Admiral's Men; in 1598 Francis Meres suggested Jonson was "the best for tragedy" in his work Palladis Tamia. Sadly, none of Jonson's earliest work was preserved, with his undated comedy, The Case is Altered, being his earliest surviving play. In 1597, Jonson was arrested and imprisoned for his participation with Thomas Nashe in writing the seditious satire, The Isle of Dogs, leaving only evidence of satirizing Lord Cobham today. In 1598, Jonson produced his first success, Every Man in his Humour. Among the cast was William Shakespeare. The play was followed next by Every Man Out of His Humour, a failure of a tempt to imitate Aristophanes, and Cynthia's Revels in 1600, all satirical comedies. By the end of the year, Jonson had killed an actor of Henslowe's company, Gabriel Spencer, in a duel on September 22 in Hogsden Fields. Jonson was arrested and tried for murder at the Old Bailey; however escaped hanging, after being visited by a Roman Catholic priest and converting to Catholicism, by claiming benefit of clergy and was imprisoned only shortly but giving up his property and being branded on his left thumb. Only a few months later, Jonson found himself performing at the Globe Theatre. 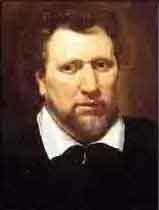 In 1601, Jonson was employed by Henslowe to revise Thomas Kyd's The Spanish Tragedy, a hackwork suggesting financial difficulties. With the beginning of the reign of James I of England in 1603, Jonson, amongst fellow poets and playwrights, welcomed the new King. Jonson adapted himself to the demand for masques and entertainments and was fostered by both the king and his consort, Anne of Denmark. Epicoene, or the Silent Woman: Still to be neat, still to be drest. Two of the greatest stanzas from the play. Epitaph on Elizabeth, L. H.. One of Jonson's finest lyrics. On My First Sonne (on my first son). Written about his son's death. Song: To Celia. This poem is known to be the key-note of the 17th century. Still to be Neat. This poem's real title is "Simplex Munditiis".